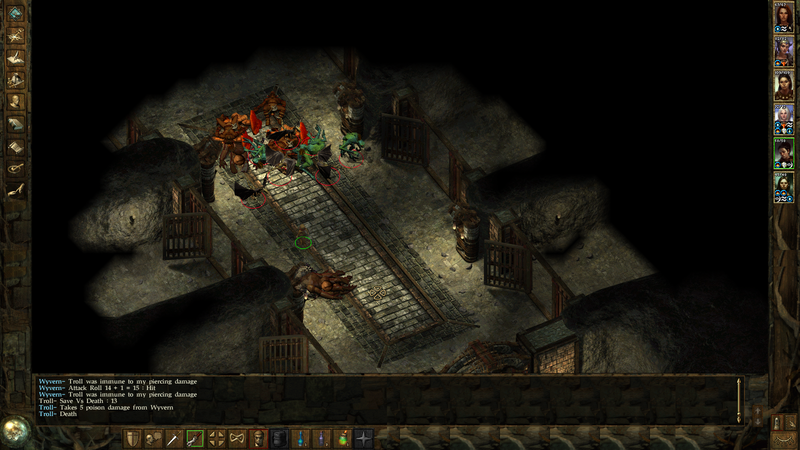 Last time, I told you about my party and I’ve beaten the last two big baddies of Icewind Dale. Now it’s time to get serious. 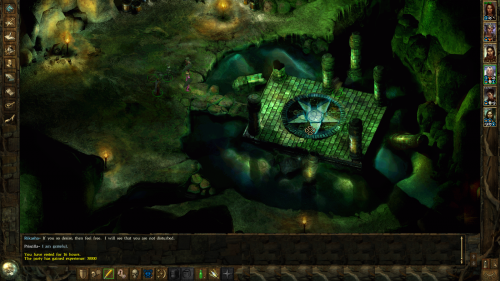 I’m going to start to play Heart of Winter, which I know nothing about. The expansion, if you get to it directly instead of visiting from Kuldahar, starts in Lonelywood. This is a town about the size of Easthaven, maybe slightly bigger and slightly warmer. I already cleared out my inventory last time, so all that’s left is to explore the town and actually talk to everyone. One thing I should probably mention that happened last time is that I was met with a shaman who told me what was going on. The plot is basically revealed right at the start this time. A barbarian king rose up from the dead, possessed by the legendary warrior Jerrod, except there’s some darkness in there to. The shaman told me this and then disappeared. 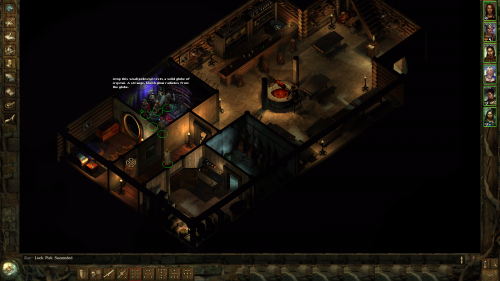 I started this session in the healer/merchant’s home. I decided to explore the back room and immediately found a secret door with a locked and trapped chest, containing a sling, some gems and 2500 gold. I saved my game just in case and tried to steal it. It worked without a hitch. The bartender used to be a wizard, which is why he has the secret room. The healer sells a bunch of high-priced items. There’s also the bowyer who sells ammo and what may be a decent bow, but I’m not really sure. There was another secret room at the inn, containing a magical robe. It wasn’t very good for my guys, but it was worth good money. Even this early, I can tell Heart of Winter rewards exploration. Talking about it with the owner had him offer to sell me his old stuff – he used to be a wizard. 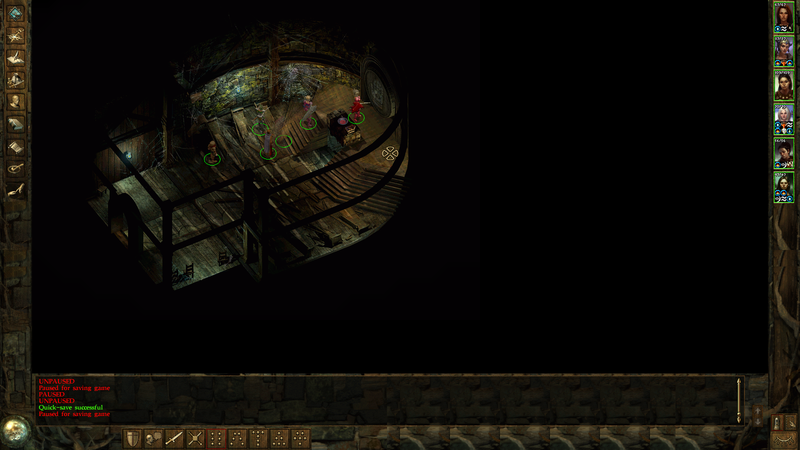 A refreshing quest I got was when a girl told me her brother fell into the well. I thought it was just a cliche quest where I have all the time in the world to save a kid from drowning, but it turned out the girl was lying. 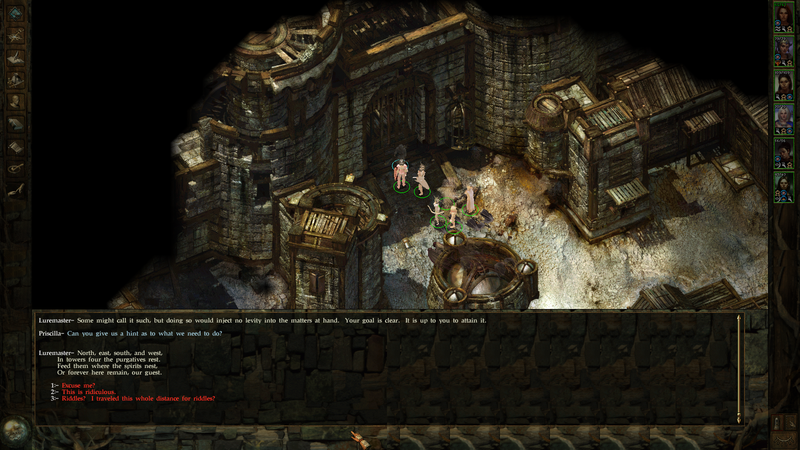 I even managed to slightly mend her broken family, convincing her mother not to cheat on her father at the inn. In towers four, the purgatives rest. Or forever here remain, our gurest. Fourt men lie cold, yet no one mourns. and from my work their praise is shorn. The guy that teleported us here actually owns a shop to, so I bought a bunch of stuff, including the famous Bag of Holding. 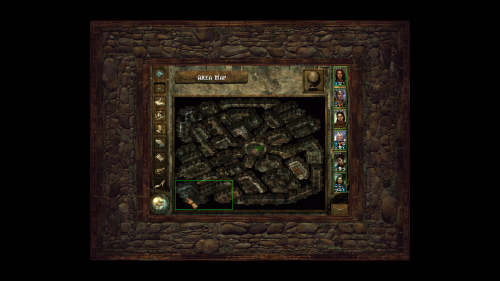 Then I used the right set of stairs to the upper courtyard and died in a fight against a different team of adventurers, also trapped here. They were of the less do-goody type, I guess. In any case, I had to reload and then encountered a bug. The right stairs seem broken at first, but when you walk over them, the illusion lifts and you can transition to the upper courtyard. Well, the illusion refused to lift, no matter what I did. I tried various fixes, community patches, saving and reloading inside a building – I’ve tried all I could think off, but it didn’t work. In addition to the stairs bug, reloading my quicksave kept having me reappear at this spot. I lost about an hour trying to get through it and then lost an extra 30 minutes by returning to an older save, back in Lonelywood. This ended up actually saving me gold. As soon as I got back to the castle, I went straight to the right area, to avoid the bug if I can. It didn’t reappear and after a few tries, I defeated the enemy party. They dropped a huge amount of items, including the three I previously bought from the merchant who got me there. They also dropped a bunch of gems, so I went up to near 200.000 gold. Last but not least, and I only discovered this later, there was a Potion of Transference in the bag of holding. It allowed Alana to get 2 points of Wisdom in exchange for a single point of Dexterity. I cleared the two eastern towers and then the session ended. I was getting tired. 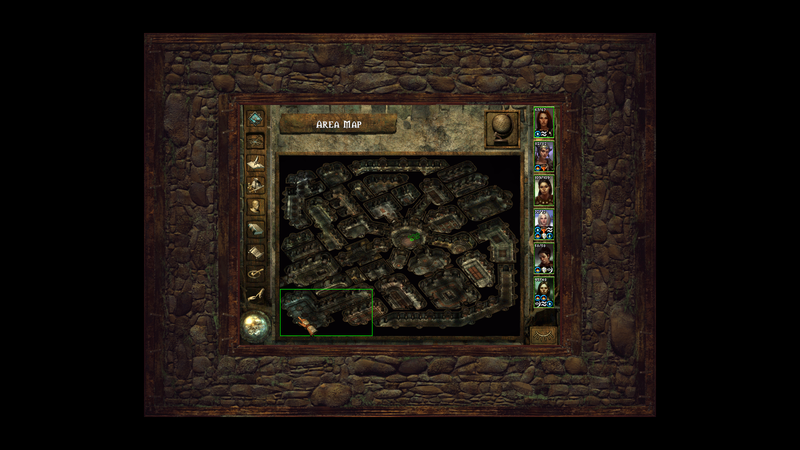 The good thing about my new low-end PC I have for the weekends is that it’s perfectly fine at playing games like Icewind Dale. I copied the game on my USB and continued this quest back at home. I cleared the other two towers and then got stuck until I did some googling. I know, that’s cheap, but in my defense, I expected some sort of puzzle based on what I got from the Luremaster (the ghost), but it ended up being much simpler than that. Once I triggered the leavers in each of the four towers, a set of stairs also appeared in each of them. The stairs appear after a switch is pulled in one of the other towers. Each set of stairs led to a room. One had me fighting a group of magical constructs I forgot the name of. They weren’t hard to kill and they dropped minor enchanted equipment, converting into about 20.000 extra gold for me. One was a riddle. I didn’t exactly know what the answer was, so I instead used the process of elimination and ended up with Wind. One was a russian roulette type of deal with six heavily trapped chests and only one containing what I needed. One was a fight against some myconids and mustard jellies. Each of these challenges gave me experience as well as a scroll containing part of the story about the four Watchknights of Castle Maluraded. Each tower has a challenge room. However, this wasn’t the actually way to progress to the next area. All I needed was the Holy Symbol of Helm from one of the towers and to place it in the bowl on the altar in the offering room. This opened a passage to the crypts. I’ll try to shorten the story from this point on. The symbol of helm needs to go on the altar for the passage under it to open. This is explained in a book found on the altar. The crypt was huge and infested with mostly undead. 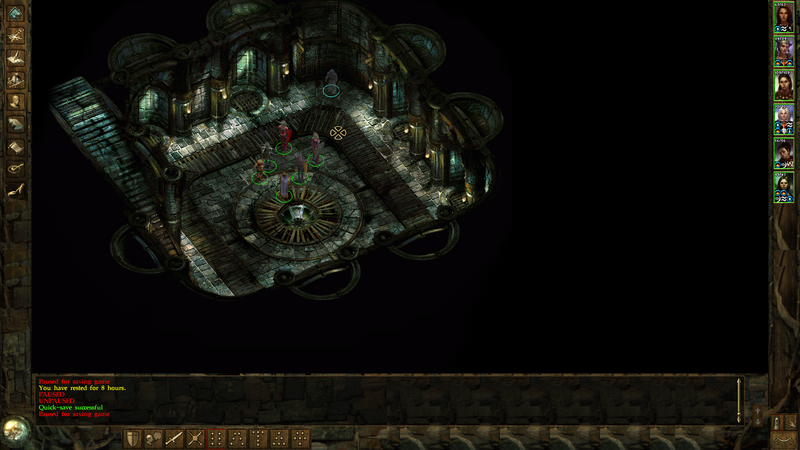 The only exception was a group of oozes in a single set of rooms near the end of my exploration of this place. The undead were easy enough to handle and consisted of ghosts, crypt fiends, skeleton warriors, those bone golem types and some revenants and wights. Only two of these groups gave me trouble. This was a first in these games for me. The treasure pile contains gold and gems and is surrounded by traps. Revenants are sort of like trolls in that they need to be finished off with fire. A group of them bugged out at near death, so I wasn’t able to kill them and had to revert to a quick save. 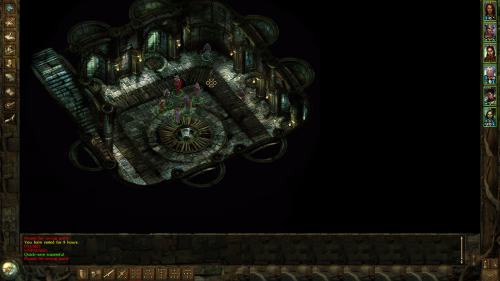 Crypt fiends die easily and definitely aren’t a huge threat, but they do the annoying thing of casting teleport, which sends a party member to some other random location in the area. Later on, this wasn’t a big deal, but as I started exploring, I was frequently sent behind enemy lines, so I again had to save and reload often. The map of the crypt. The central area is clearly visible and surrounded by initially locked doors. 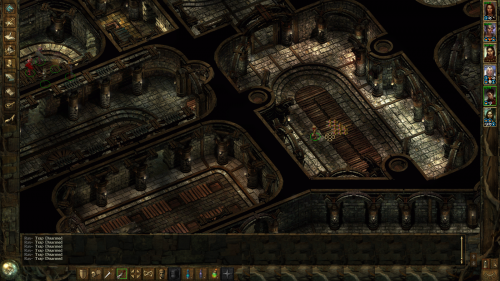 The goal of the area was to gather keys which open doors in the central room. Once all the doors are open, the final door is revealed and the party can enter the watchmen’s crypt. There, I had to put each of the four scrolls into the appropriate sarcophagus. It was easy to figure out – the scrolls describe which weapon the watchmen used, so you just have to match the story with the weapon in the sarcophagus. Once I did all that, I was able to leave the courtyard and actually enter the castle. The inside actually had non-hostile ghosts, but there were also hostile spectral guards, which packed quite a punch. The top floor and the dungeon also had a lot of beholders, some of the worst enemies Dungeons and Dragons has to offer. They can completely disintegrate a character, meaning the basic strategy is to buff up, hope for the best and save after each successful fight. 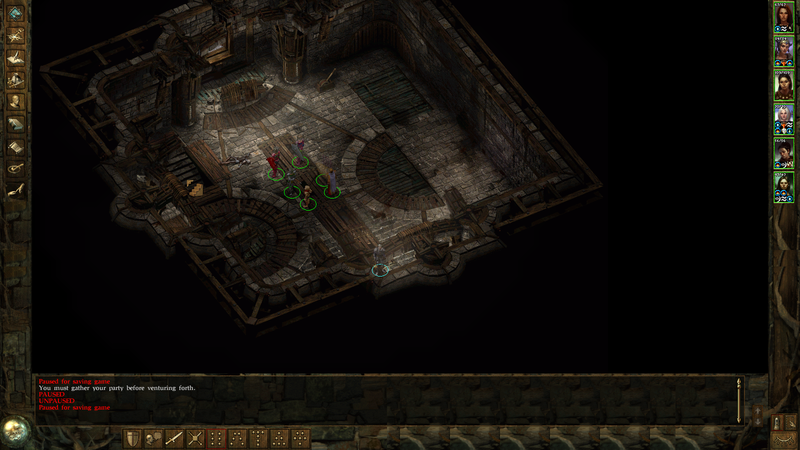 The goal in the castle was to go to the top floor and kill lord Maluraded’s spirit in order to get a key to the dungeon. There, I had to fight my way through to the bard’s cell, whose spirit is actually the Luremaster. From there, I had to find a way out through a secret passage of caves, where Jackals were the enemy I fought. I’m not sure what the Jackals are, but I’m guessing they’re a barbarian tribe, which would made sense. They had shamen, jackalweres and some strange giant demons in their ranks. I wasn’t able to rest inside their area, which sucked, because it just meant I had to walk back and waste time. 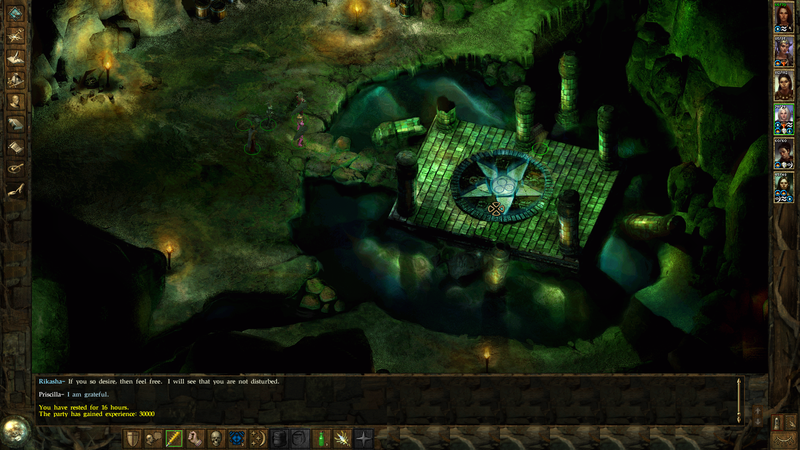 A memorable moment here was when I first got to the dungeon. There were two levers at the entrance, each opening one side of the cells in the next room. I could have ran in and fought my way through the monsters, or I could have opened both sides and let them fight between themselves. The AI let’s the monsters fight each other, but as soon as I get in range, they all focus on me. To escape from this area, I had to gather five gems in adjacent caves. Some were easily acquired, but for some, I had to get through some extremely difficult fights. Once I got the gems, I needed to bring them to a chest in one of the caves. This would place an improved version of the gem on the altar in each of the five caves. Once I finally got those, I had to put them on a portal platform in the main jackal cave. There, I was finally able to transport to the surface and into the Luremaster’s inner sanctum. It takes a long and slightly convoluted process to activate the portal. 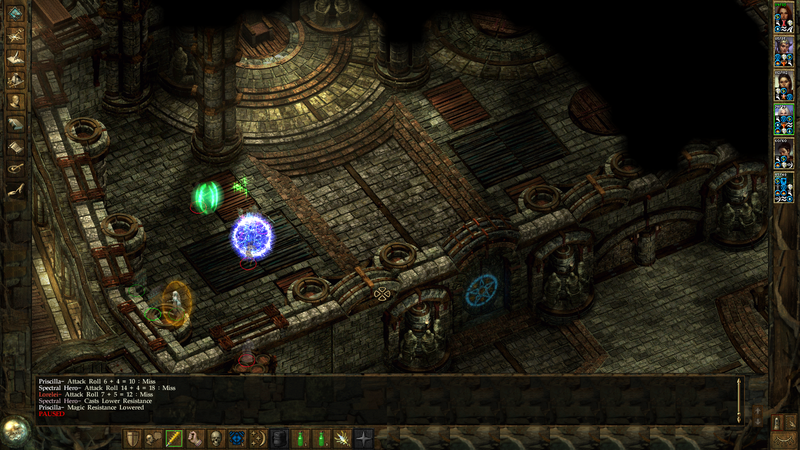 There, I had one last insanely difficult fight against him and a bunch of spectral heroes. I made it a bit easier for myself by moving to one side of the sanctum as soon as I was able. In each attempt, this would usually give me a chance to kill one of the magician spectral heroes before they could act. It’s always a good thing to stop hostile spell casters as soon as possible. The fight starts with the Luremaster on the throne and 3 spectral heroes on each side of the room. Moving to one side is almost a must. Once that was done, I got a tarnished ring, which I was able to use to go back to Lonelywood. If you ask me, it was an extremely underwhelming end to the quest, though the quest itself was definitely interesting. I sold all my stuff and ended up at above 400.000 but still under half a million gold. With nothing to buy in town and most of the town explored, I’ll be moving out to the world map next.